Holiday Light Tour for that special time of the year.It’s that time of year again! The holiday season always brings a new kind of magic. Enjoy a warm, comfortable ride in one of our luxurious rides. 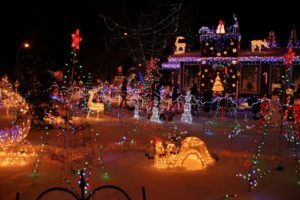 Enjoy the beautiful holiday light tours that Minneapolis and the surrounding areas have to offer! Let it snow as you sit back and relax in our new fleet of pristine vehicles. For our holiday light tours we usually recommend the limo service as the best option for friends and family, but if it’s only a couple then we recommend the town car service . It’s spacious and allows for maximum comfort, even if the snow is piling up! Enjoy holiday lights this year in style and without stress. You will have the best seats possible – enjoy in the synchronized light show, beautiful holiday light displays. No longer will you have to navigate tight city streets trying to find the beautiful colorful lights. Let our professional chauffeurs take care of all the driving on rough roads during the night. Just enjoy the holiday lights with your family as you enjoy this special holiday occasion. We understand that holiday light tours are a great time to have fun and enjoy time with family. That’s why we want to make it as momentous as possible. Price: We have among the lowest rates in Minnesota. We offer an affordable limo service that rises above the competition. Premium Customer Service: 1st Class Transportation has a 5 star rating and always guarantees a great time! Experience: Years of experience in holiday light tours has allowed us to know where all the hot spots are. If you do it on your own, you might not see all the best spots. Whether you are looking for Town Car Service or Limo Service in Minneapolis for the Holiday Light Tours, we’ve got you covered. 1st Class Transportation tailors to it’s customers needs so that they get the best deal around, every time. Because seeing our customers have a great time shows us that we did the job well. Are you ready to be a part of this magic? Choose your pick up location and dive into the colorful world of lights. Click book now below to start your fun holiday light tour process!